Mater de Mercede: Tiber and the Moskva? 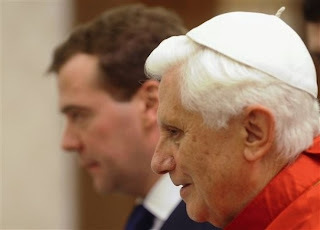 "This afternoon, 3 Dec 2009, His Holiness Benedict XVI received in audience Dimitri Medvedev, president of the Russian Federation. During the cordial discussions pleasure was expressed on both sides at the cordial relations that currently exist between them, and it was agreed to establish full diplomatic relations between the Holy See and the Russian Federation.